From day 1 when we brought the the dog home, we let him sleep in a large box (even bigger than his new dog house) and he has loves it even more than his dog bed every night. 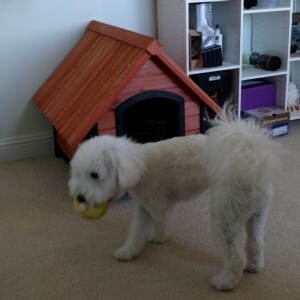 But ever since Waffles, our maltipoo (Maltese poodle), celebrated his first birthday and reached his full size at around 15 lbs, my wife and I decided it's time to buy a real home. So I've been on the lookout for the perfect cutest dog house for inside the house. Even though plastic dog house were available in all sizes, shapes, and prices, they all felt a bit cheap and wouldn't match around the house. I even contemplates building my own DIY dog house if I couldn't find the perfect real-wood dog house for my dog. Waffles is now almost 1.5 years old and we finally settled on the Small Arf Frame Dog House by Pet Squeak (4.3 stars out of 5 with 206 reviews) for about $60 shipped free. The idea of building my own dog house crossed my mind several times. I figured screwing together a floor, 4 walls, and a roof couldn't be that difficult and might be a fun weekend project. I had most of the tools, but quickly came to the realization that anything I built would be rough around the edges, meaning less detail oriented than pre-fabricated assembly required dog houses purchased online. I estimated the cost of the materials to build the house would be approximately $30-40, depending on wood quality, and take 5 hours to purchase materials, measure, cut, construct, and paint. The Arf Frame Dog House comes in 4 sizes (extra small, small, medium, and large). It's designed for a cozy fit, so if your dog needs more space, you may want to consider a larger size. I ended up purchasing the small, which gives my dog 24-1/2-inch (wide) by 20-inch (deep) by 26-1/2-inch (high) with a door opening of 9-3/4-inch (wide) by 15-1/4-inch (high). Out of the box, the white cedar pieces immediately filled the room. The smell was so strong I was initially afraid the dog wouldn't be accustomed. The smell does dissipate with time. Next, I notice the wood pieces are nicely pre-fabricated. Most of the smaller pieces of wood have been pre-assembled into larger pieces as to limit the amount of work required for assembly. A nice touch! Despite how amazing the dog house looks with the individual piece wood siding, the package arrives with 9 pieces of wood ( 4 sides, 2 bottom pieces, 3 roof pieces) and 8 nuts and bolts, and 12 screws. All the wood is pre-fabricated and notched to make construction very simple. The floor of the dog house doesn't sit directly only the ground and is supported by 4 legs covered in rubber feet. It took me 30 minutes from removing the parts from the shipped box, reading the instructions, to assembly. Anyone can do it. Note that the box does not include tools, so you'll need your provide your own hex screw driver and regular screw driver. Once built, I can easily carry the house up the stairs and the small size just perfectly fits through doors (my guess is it may be difficult with medium and large). We moved all his toys and blankets from his cardboard box into the new dog house. We re-positioned his cardboard box so he couldn't get in. We spent a couple hours with him, introducing him to his home with treats and with throwing the ball into the dog house. At first, he was scared to even enter, but by 30 minutes, he was entering on his own. The first night was a bit disastrous, as he barked throughout the night. I think he was confused by the new living situation. But by the second night, he was used to it and sleeping normally through the night again. By day 2, most of the smell from the white fir is now gone. Waffles loves his Arf Frame Dog House and we look forward to the day we can recycle his old cardboard box house. As much as I regret passing on a DIY weekend project, I actually very much like the look and feel of this dog house. I'd have no problem leaving this in the living room and think guests would highly compliment it. The quality is very good, and since it's designed for outdoor environments, I'm a firm believer this dog house will hold up forever indoors.